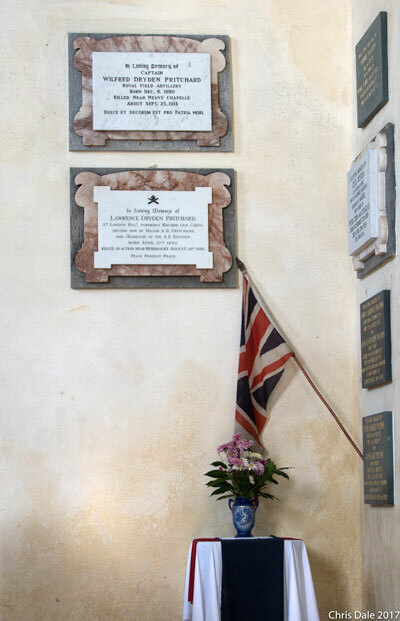 This is about the stories behind plaques commemorating two brothers who both died in the First World War. The plaques are at Canons Ashby in Northamptonshire. Something about their wording made me want to find out about them. 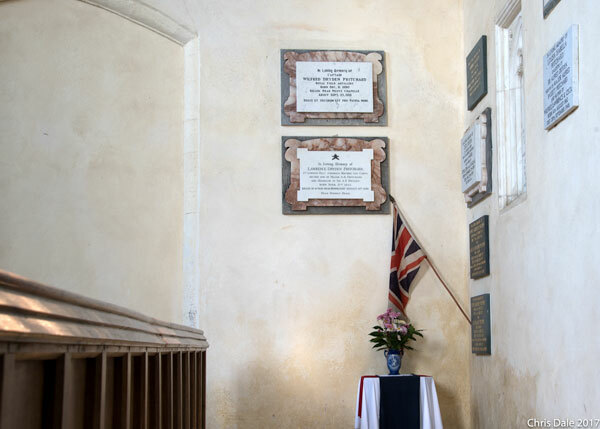 I am always drawn to the war memorials in churches, particularly those of the First World War. They often carry more than names and dates, reciting the place of death and perhaps other biographical detail, adding a human element to the narrative of campaigns and battles. I read a fair amount about those battles, tracing trench names on military maps and occasionally going to see the places they describe. Names inscribed on village war memorials convert those muddy, bloody stories into human terms – I picture the telegram boy pedalling along the lanes outside the church, bringing news which alters families for ever. Equality went only so far, of course. The blacksmith’s boy may have had a cemetery headstone identical to that of the squire’s son, and the private’s grave and that of the Lieutenant-Colonel may look the same; both earned their place on the town or village memorial; only the grander ones, however, ended up with a memorial plaque in the church they had left behind when they went to war. This was partly a matter of expense; sometimes it was because the dead man’s family effectively controlled the church. That was the case at Canons Ashby where the ancient church sits next to the manor house, now in the care of the National Trust. 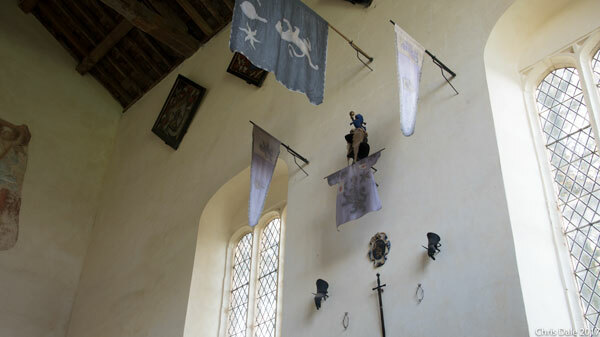 The church has been restored, plainly and beautifully, and hung with banners and mementos of a largely military nature. This corner caught my eye with its near-identical plaques one above the other with a Union Jack and some flowers beneath. The inscriptions commemorate what were obviously two brothers, the elder, Wilfred Pritchard, born in 1890, the younger, Lawrence Pritchard, in 1892. Wilfred was killed near Neuve Chapelle on about 25 September 1915 and Lawrence near Hendecourt on 28 August 1918. So far, so sadly common for the time. 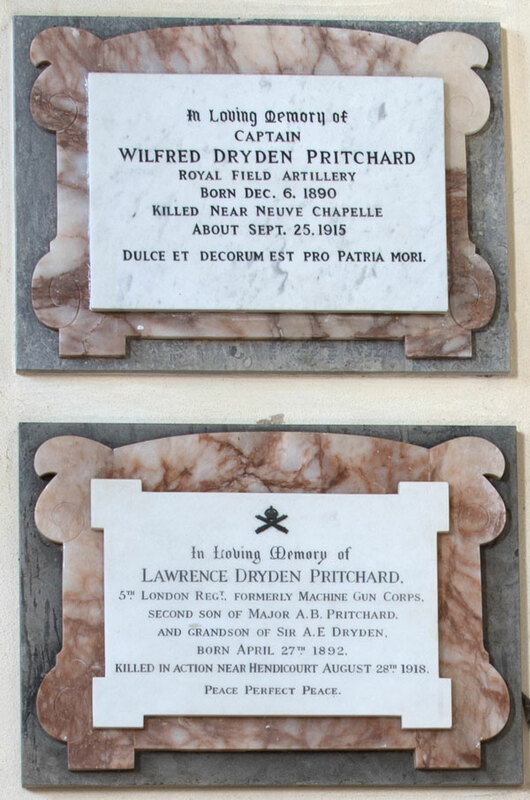 As an aside, how did boys with the surname Pritchard (and the shared middle name Dryden) end up commemorated at Canons Ashby which had been in the Dryden family since the mid-16th century? The Sir A E Dryden whose name appears on Lawrence’s plaque was Sir Alfred Erasmus Dryden (1821–1912) who inherited Canons Ashby in 1899. His daughter Louisa Isabella married Major Alfred Bassett Pritchard in 1889 and she inherited Canons Ashby in 1912 when Wilfred was 22 and Lawrence was 20 (source here). There had to be a story behind the differences in the two plaques, apparently made by the same craftsman at the same time. Wilfred gets the stirring “Dulce et Decorum est” inscription, while Lawrence gets “Peace Perfect Peace”. What was Lawrence’s story? 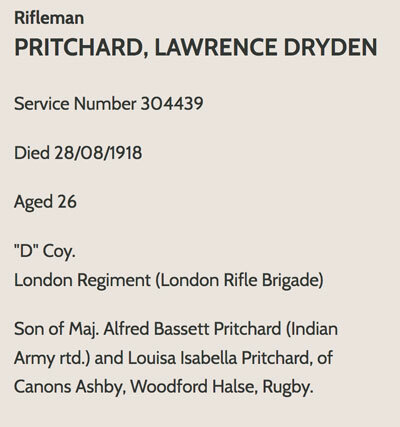 Wilfred Pritchard was a regular soldier before the war, returning from India in August 1914 as a 2nd Lieutenant, and already wounded in France by November. He was at Neuve Chapelle (10-13 March 1915) with the 4th Battalion of the Black Watch, and the Lancing page includes his detailed account of his part of the battle. Dundee Art Galleries and Museums Collection holds Joseph Gray’s painting After Neuve Chapelle, painted in 1921. The 4th Black Watch was engaged again at Loos (25 September to 8 October 1915) and was terribly mauled there. Wilfred’s Lancing page describes the circumstances of his disappearance and presumed death in the Battle of Loos on 25 September. I ran into a problem here, which proved to be one of nomenclature. Wilfred’s plaque says he died at Neuve Chapelle on 25 September; the Lancing page says he died in the Battle of Loos. The battle known as Neuve Chapelle was, as we have seen, in March 1915 and Wilfred survived to fight again at the Battle of Loos in September. Why does the plaque say he died at Neuve Chapelle? The answer proved to be that the battle formally called Loos extended as far as Neuve Chapelle (strictly this was a subsidiary attack to support the main endeavour a little to the south). The Battles Nomenclature Committee, reporting in 1921, identified the names, the start and end dates, and the geographical extent of important engagements, and that of 25 September to 8 October was called Loos while covering an area well beyond the place of that name. Wilfred Pritchard was last heard of at noon when he telephoned his Battery from a cottage to direct their fire against the German counterattack. That ends Wilfred’s story, dead at 25 during a failed and bloody attempt to move the British front line eastwards from Neuve Chapelle, itself so bloodily captured a few months earlier. 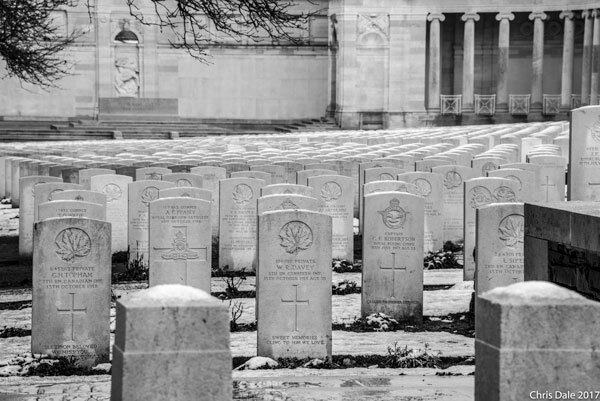 His body was not found, and he is commemorated on the Loos Memorial. Those of his time would understand the line derived from Horace on Wilfred’s plaque; the idea that it was sweet and right to die for your country coexisted with grief, both national and personal, that the country’s young men, squire’s son or blacksmith’s boy, should lie dead in French mud. I picture the telegram boy wheeling his bike to the door at Canons Ashby with the envelope which every family dreaded. If Wilfred’s story ends sadly, he did at least win praise for his career as a soldier. His brother Lawrence met the same fate in the end, but his path to it was rather different. The careful wording on his plaque, as I guessed on seeing it, told an even sadder story. On 23 August 1916 he was described at “unfit for service” and it was recommend that “his services be dispensed with”. In August 1916, Britain was reeling from the losses of the Battle of the Somme, then two months old. In proportion to their numbers, the junior officers had been hit harder than any other rank. Conscription had been in place since January and new Officer Cadet Battalions were formed to give a short training period to ex-rankers who became Temporary Officers (and, less politely, “Temporary Gentlemen”) to fill the gaps. For the services of a Second Lieutenant to be “dispensed with” only two months after setting foot in France implies a particular degree of inadequacy. In September, Lawrence was commanded to resign his commission and immediately became liable to conscription. He enlisted in the 5th (City of London) Battalion (London Rifle Brigade). On 27 August 1918, the battalion was in front of Bullecourt. Bullecourt is the only place I have ever been to which felt full of ghosts and foreboding before I knew its history. I was there last winter, at the crucifix which was (as I found out later) at the centre of two bloody battles in April and May 1917. 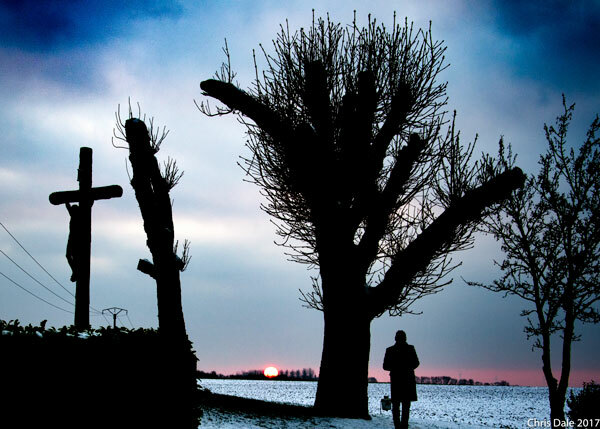 It was dusk, and the sun was setting to the west across a field in which, it is said, the bones of Australian solders who died in those attacks still lie unclaimed. Bullecourt was taken after the second of these battles, but was lost again in the Kaiserschlacht, the great German Spring Offensive of March 1918, that last gasp of the German army before they were finally driven back. 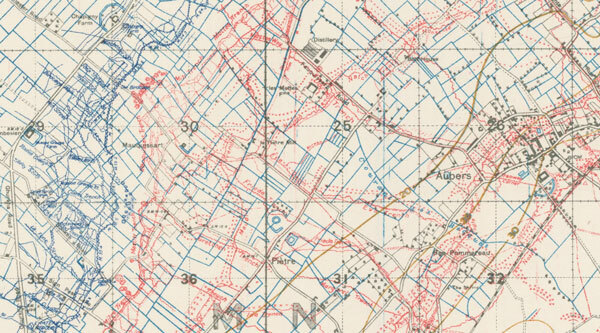 At the time of the map extract below, 25 April 1918, the area shown on this map extract was back in German hands. You can’t see the detail in this extract, but I give it for context. The village at left is Croisilles, and Hendecourt-les-Cagnicourt (the full name of the village given as Hendecourt on Lawrence’s plaque) is at top right. Bullecourt is right of centre at the bottom. This map extract comes again from the National Library of Scotland at http://maps.nls.uk/view/101465074. On the night of the 27th of August 1918 the 1/5th (City of London) Battalion (London Rifle Brigade) was in two trenches at Burg Support, some 500 yards to the east north east of the village of Croisilles in preparation for an attack the following day. At 12.30pm the 28th of August they attacked the eastern side of the village of Bullecourt … . C Company was on the left, D Company in the centre with B Company on the right of the attack. 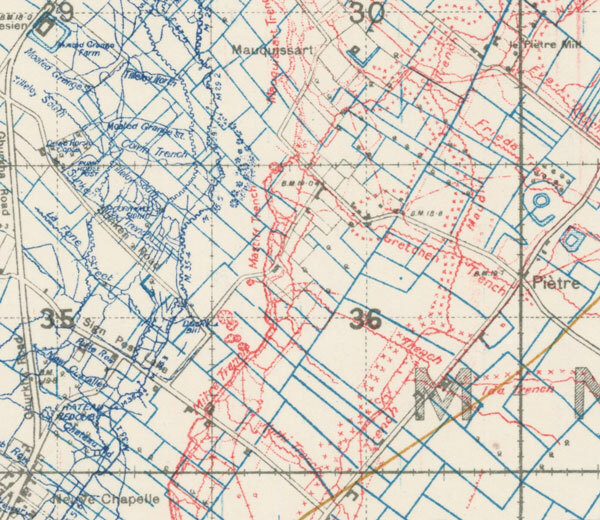 When the attack began C and D Companies lost direction and had to consolidate their position at Hendecourt where they found themselves in the front line rather than in support and were surrounded by enemy machine guns. B Company attempted to come to their aid by outflanking the machine guns but suffered heavily and were forced to dig in and take cover….The survivors were then withdrawn to Knuckle Trench and to the Hindenburg Line to rest. This extract does not actually say where Lawrence died. We know from his plaque that he died at Hendecourt so was not among those who made it back to Knuckle Trench. …we see Burg Trench running more or less north-south from the top left corner, and The Knuckle at its lower end. 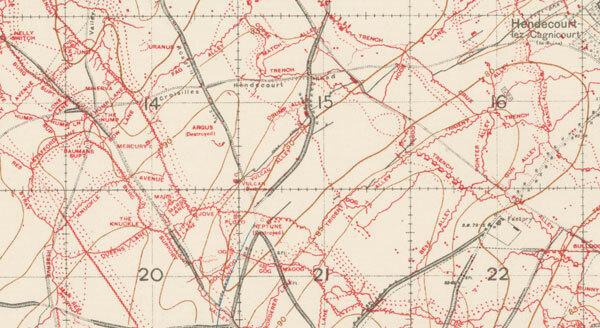 Hendicourt lies a mile or so the east of Burg Trench, and Bullecourt is off the map to the south (see the first map extract above). The battalion went eastwards to Hendecourt in order to move south to the east side of Bullecourt. And so the telegram boy called again at Canons Ashby. Hendecourt-les-Cagnicourt was captured by the 57th (West Lancashire) and 52nd (Lowland) Division on the night of 1-2 September 1918, four days after Lawrence died outside it. Lawrence’s record at the Commonwealth War Graves Commission say that he is buried at Vis-en-Artois, a large cemetery three miles or so north of Hendecourt. I was there in December and would have gone looking for him had I known he was buried there. I don’t know when the two plaques were put up at Canons Ashby. I picture some heart-wrenching discussions as the wording was agreed – deciding what words gave credit to the captain while not derogating from the honour due to the rifleman who had shared his childhood and now shared his fate. How did they decide to give Wilfred the stirring “Dulce domum” inscription while Lawrence got “Peace perfect peace”? Whether or not anything conscious turned on that at the time, it was that difference in wording, as well as the lack of a rank for Lawrence, which tipped me off that there was a story here. There was a third son – the Lancing page for Lawrence quotes from a letter from the father saying “My youngest son is now at Wellington Nilgris studying to enter I.A”. Wellington was (and still is) a staff college in the Tamil Nadu state of India (the Indian Defence Services Staff College moved there after Partition, but I assume from the letter there was a colonial training establishment there in 1914). “I.A. was the pre-independence Indian Army. One must assume that he survived the war, or he would have had a plaque too. This entry was posted in First World War, History, Photographs. Bookmark the permalink.